Combat Veterans to Careers is excited to announce our upcoming Save a Veteran Reverse Raffle sponsored by Parady Financial Group! Only 300 tickets will be sold – each $100.00 ticket includes heavy hors d’oeuvres and entertainment for two (2), cash bar, and a chance to win $10,000! You do not need to be present to win. Join us April 30, 2019 from 6-8 PM at the Savannah Center: 1575 Buena Vista Blvd., The Villages, FL. 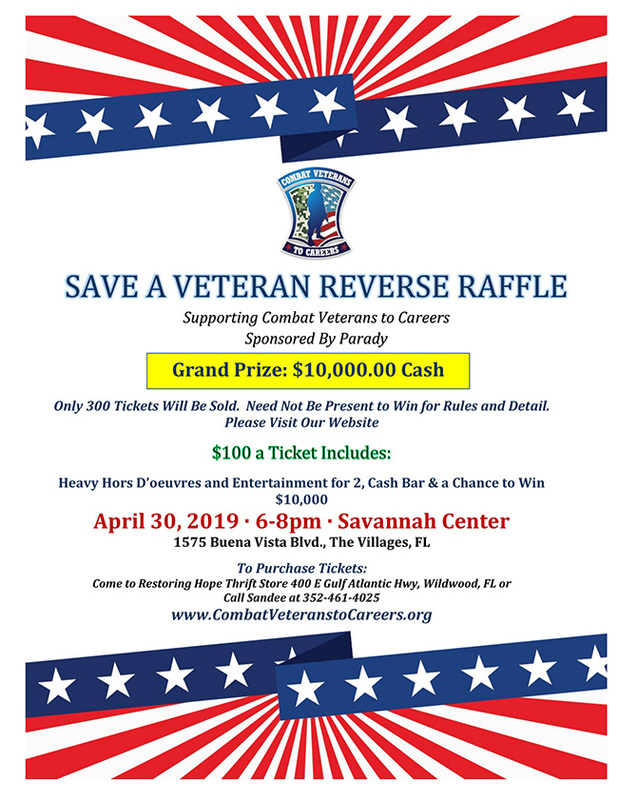 All proceeds benefit Combat Veterans to Careers in our mission to provide 360° of support and opportunities to Florida combat veterans transitioning to civilian life. To purchase tickets, visit the Restoring Hope Thrift Store located at: 400 E Gulf Atlantic Hwy, Wildwood, FL, or call Sandee at: (352) 461-4025.